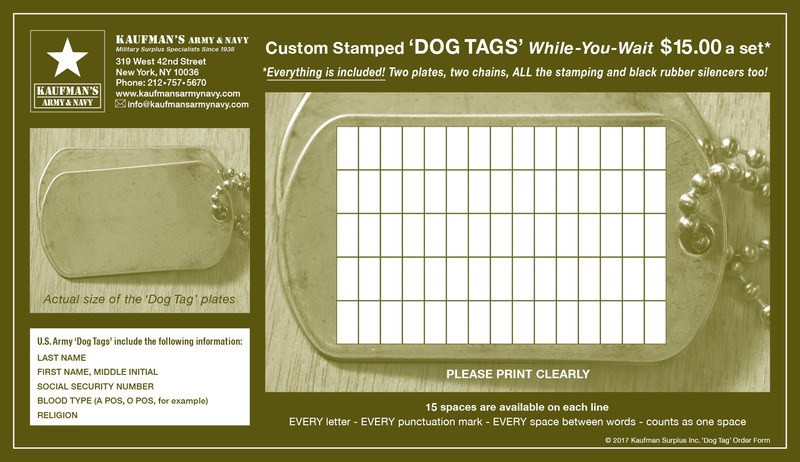 We custom stamp ‘DOG TAGS’ at our 42nd Street store While-You-Wait for $15.00 a set. Click on the image to download the form. The process often takes fewer than ten minutes depending on whether the store is busy at the time of your visit. (If you’re in a rush, we’ll do them even faster!) Multiple sets can be done too. A set includes: two stainless steel plates and chains (one 5 1/2″, one 27″) and one pair of black rubber silencers. Our chains are U.S. Army regulation and longer than copies sold elsewhere! Each plate can be stamped with up to five lines. 15 spaces are available on each line. EVERY letter – EVERY punctuation mark – EVERY space between words – counts as one space. All letters are CAPITALIZED. You can write whatever you like, and each tag can be stamped differently.